“These things are really popular,” explains Martin Lacombe as he flattens out a large piece of pink candy floss, drops three scoops of ice cream in the centre and sprinkles unicorn dust (aka coloured sugar) all over it. Folding the candy floss shell around the ice cream he holds up his invention: Ice cream burritos, which sell for $5.50 each. “I made it up and everyone loves them,” Lacombe said. He and wife Malynda opened their new ice cream shop at 1254 London Rd. in mid-March and named it Sugar Sugar. Martin Lacombe, 43, already owned Tugboat Vaping downtown when his accountant pointed out that Annaberry Ice Cream & Cakes was up for sale. “I wanted to open a second business and it could have been another Vape shop, maybe in Chatham, but I wanted to diversify,” said Martin. The Lacombes wrote a business plan, painted and cleaned up the location, built new counters and reassessed the menu. Sugar Sugar serves 28 flavours of ice cream, six varieties of frozen yoghurt, ice cream cakes and pies Malynda makes daily, plus a wall of shelving that’s slowly filling up with retro candy like Nerds and Astro Pops. The Lacombe’s ice cream selection ranges from slightly exotic flavours like Superhero, Health Bar Crunch and Raspberry Bugaboo, to old standbys like French vanilla, cookies & cream and pistachio. A cone costs $1.75 for a kid size; $3 for a scoop and $4 for two scoops. Rootbeer and Orange Crush floats sell for $4.50 and sundaes with three scoops of ice cream are $5.50. Ice cream cakes are priced at $16.95 to $21.95, depending on size. Martin said Sugar Sugar is going to introduce birthday packages that will include the cake, loot bags and other treats. When better weather arrives, the Lacombes also plan to install a fryer and become Sarnia’s only funnel cake maker. Funnel cakes are served with confectioners’ sugar, whipped cream and berries. Sugar Sugar is open Monday to Wednesday noon – 8 p.m.; Thursday to Sunday noon- 9 p.m. Hours will be extended in the summer. See more details on the Sugar Sugar Facebook page. A well-established diner shares the building at 1254 London Rd. with Sugar Sugar and recently re-opened. Ole Country Diner has served up home cooking since 2009 but shut down when its lease expired at the end of February. Two months later, owners Terry Kavanaugh, Kyle Kavanaugh and Nick Chorostecki worked out a new lease agreement with the landlord and Ole Country Diner is back in business. Ole Country Diner opens every day from 8 a.m. – 3 p.m.
Got an interesting business story? 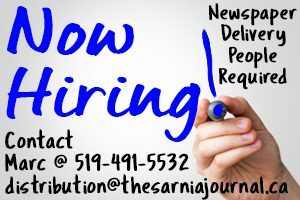 Contact Cathy at cathy.dobson@thesarniajournal.ca or 226-932-0985.